The fawn isn’t abandoned and you should leave it right where it is. Read on to find out more about what’s going on with these adorable baby deer that seem too small to be left on their own. There is a strong probability that you did not find an abandoned fawn. Female deer hide their newborn fawns in tall grass or brush and move some distance away to feed to avoid drawing predators to their offspring. With the proliferation of deer in suburban areas, sometimes this happens right in our own yards. The fawn simply waits in hiding until its mother returns. Soon, the fawns will be strong enough to follow the does and run from predators, and they no longer need to spend hours alone in hiding. Though it seems that they are vulnerable, these young fawns are not totally helpless. Their spotted pelts look like dappled sunlight on the forest floor and offer great camouflage. They do not have strong scent that would attract predators. Fawns are also programmed to keep totally still and quiet when hiding while their mother forages. 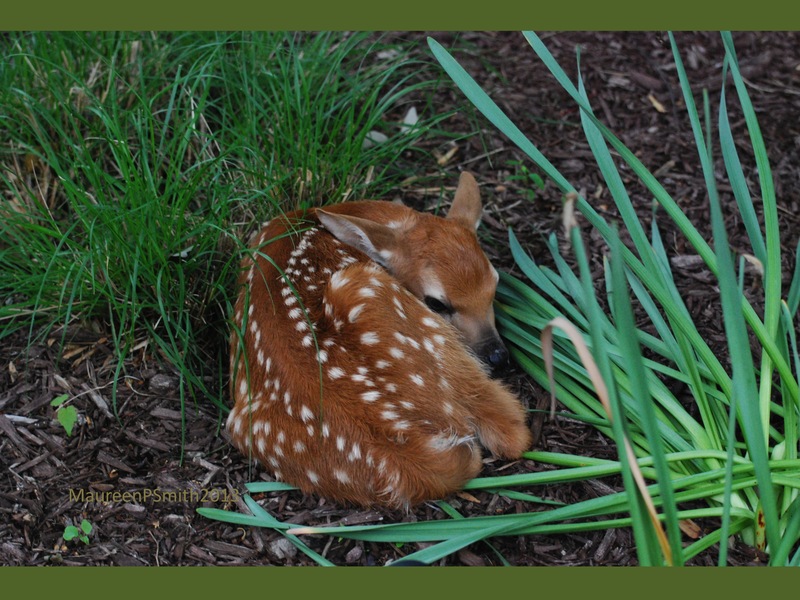 The combination of the physical attributes and the behavior of both does and fawns are remarkably successful at limiting depredation at such a vulnerable time. And consider this: illegally raising deer fawns greatly reduces their chances of survival. It is difficult for an untrained person to provide a quality diet and captive care, and due to a hand-raised deer’s lack of fear of humans, these animals are more likely to be hit by cars, killed by dogs, or shot by hunters. The photo to the right shows what someone did to try and protect a “pet” wild deer from hunters: they put a collar on it. Unfortunately, this deer was totally unafraid of people, and walked right up to a hunter. Luckily for this particular animal, the hunter just snapped this picture and let it go on its way. The next time it approaches a human it will probably not be so lucky. There are cases where it is okay to help lone fawns. If you notice that a fawn is clearly injured or that it is near a dead adult doe, then it is acceptable to seek help. Start by calling your local animal control department or nature center, who can either take the animal or help locate a licensed wildlife rehabilitator who can. If a hidden fawn is discovered on your property, it’s up to you to keep your pet dogs and your children away from it. Please do not closely approach or handle wildlife .